What pathological processes contribute to the severity of brain injury and the degree of recovery after an acute stroke? By characterizing the pathophysiological processes that are linked to clinical recovery, we attempt to delineate which injury mechanisms have a substantive impact on patients’ lives. 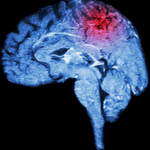 We focus on secondary brain injury, which includes the study of brain edema, hemorrhagic transformation and the interrelationships with post-stroke inflammation. We develop neuroimaging tools to characterize these maladaptive events, which in turn, can serve as the link to discovering underlying candidate pathways. Below are some examples of our work focusing on pathophysiology of secondary brain injury.